By Rup Narayan Dhakal: Pokhara—Tourism entrepreneurs from Pokhara have urged the government to punish the companies who allegedly involved in fake rescue of trekkers and mountaineers in Nepal, on Monday. Holding a press meet, entrepreneurs pressured the government to punish those who had been found culprit by a high level government probe committee and recommended for legal action. According to the Trekking Agencies’ Association of Nepal (TAAN) Western Regional Association Pokhara former chairman Som Bahadur Thapa, insurance companies are denying making travel insurance to the persons who wish to visit Nepal in recent days. He further added that those companies also had set a deadline of September 1, 2018 for the Nepal government to punish the companies who had involved in fake rescue racket. But the government has done nothing to those 15- trekking, hospital and helicopter companies that allegedly involved in organized rescue scam. TAAN WRA Pokhara advisor Dambar Bahadur KC asked why government didn’t punish those who were found accused. He also feared the government’s connection with those accused. The tourism ministry had formed a committee headed by joint secretary Ghanshyam Upadhyay to probe the unnecessary rescue on 4 June, 2018 and a report was submitted to tourism minister Rabindra Adhikari on 30 July, 2018. But according to Ganesh Bahadur Bhattarai, Pokhara Tourism Council former chairman, the government is reluctant to take action against the accused 15 companies involved in forge rescue. TAAN WRA Pokhara immediate past chairman Deepak Raj Adhikari feared that the upcoming tourism season- October, November and December- in Nepal could face drought as insurance companies are not willing to ensure the travel of those who wish to visit Nepal. He further added that the trekking routes in Nepal also are being overlapped by the haphazard road building is diverting the tourists to Myanmar, Maldives and other countries. 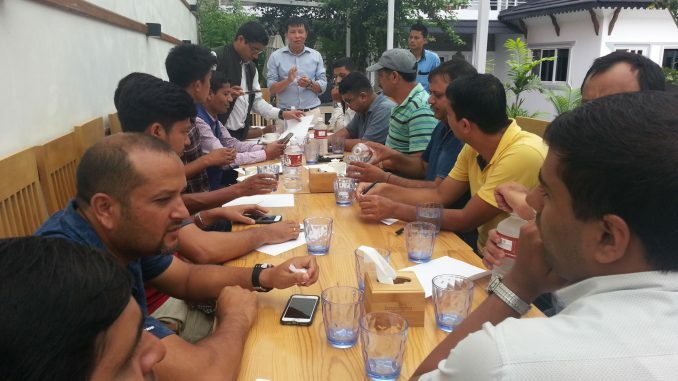 Restaurant and Bar Association Nepal (REBAN) Pokhara former chairman Gopi Bahadur Bhattarai said that the forge rescue was a kind of organized crime and those who involved in such a game should be punished and their companies should be seized. Nepal Association of Tour and Travel Agents (NATTA) Western Regional Association former chairman Pom Narayan Shrestha urged the government to make a provision of automatic insurance on arrival in the airport or in the bordering points of Nepal. Entrepreneurs from Pokhara organized today’s interaction in an eleventh hour though the international news agency AFP for the first time and then Nepali media continuously reported about the issue of Nepal’s unnecessary helicopter rescue.